Following is North Sooke Community Association’s presentation to Council, made on September 24, 2018. It is reprinted here with permission. Their overall position was that once money (to the tune of millions) is committed to straightening portions of BC Highway 14, a second access road will never come to pass. This second access road is critical to future of Sooke. Here is their presentation. Good evening your worship and council. Thank you for giving us the opportunity to address you tonight. I am Eric Boucher and reside on Connie Rd and this is Jean Palmart from Ayum Place. 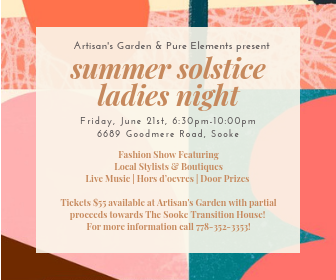 We’re presenting on behalf of The North Sooke Community Association which encompasses residents in the area between the Sooke District boundary with Metchosin, and West to the area of Cooper’s Cove. I’d like to acknowledge other members of our delegation present and ask them to raise their hands (18 present). We are here tonight to state our concerns related to highway infrastructure, and specifically the recent proposal by the Ministry of Transport to realign portions of Highway 14. In June the Ministry of Transportation and Infrastructure (MoTI) initiated public consultation regarding proposed investments on the Highway 14 corridor. What raised our concern was a proposal to realign a 5.1 kilometer portion of Highway 14. There is no evidence of a more comprehensive plan to connect to connect this project to the East or West of this section. Over the long term this is perhaps a $50 to $100 million transportation project. We’ve spoken with staff at the district and provincial level and have become much better informed about this issue. The most recent highway infrastructure study is dated 2008. Obviously much more development has occurred in the last 10 years and growth has accelerated since this last study was completed. One piece of data that resonated was that the peak designed capacity of a typical two lane rural highway such as ours is about 800 vehicles per hour. The most recent MoTI data from 2017 shows that peak volumes are exceeding 1700 VPH. The current proposal seems to actually be based on the recommendations of a 1991 study which considered the development and plans of 27 years ago, however the consistent themes have been the inadequacy of Hwy 14 and recommendations that improvements, including alternate or parallel routes, are essential to achieving adequate levels of service. In July we held a neighbourhood meeting with 50 in attendance to discuss the realignment proposal. Surprisingly the tone was not an emotional Not-In-My-BackYard (NIMBY) response but rather the clear-headed consensus that this proposal is NOT a good idea from a community planning perspective. We’re convinced there need to be other options under consideration and there needs to be a more comprehensive plan. MoTI conducted a community engagement in June and July and received 856 responses. The results have been published. One important conclusion we drew from the survey results was: just as many respondents ranked this realignment proposal at or near the BOTTOM of their priorities as ranked it near the top. Our conclusion from these responses is that our community is clearly divided on this issue and there is certainly not a consensus that this project, as presented, is a priority. One other concern is that we’ve heard from a few sources that the greater the investment in upgrading the existing road corridor the less political appetite there will ever be in the future to invest large sums in alternate or parallel route solutions. We agree that’s probably quite a realistic assessment. This project commits our community to a long term transportation plan that we probably can’t change much in future. So we need to get this right. We draw council’s attention to MoTIs timetable to make announcements on future priorities, planning, and design this fall. And that construction might start in the spring. So time is certainly a factor. Encourage and support ongoing improvements to Hwy 14 that address safety issues. Request that major infrastructure changes be deferred until a more comprehensive plan is prepared and supported by council. 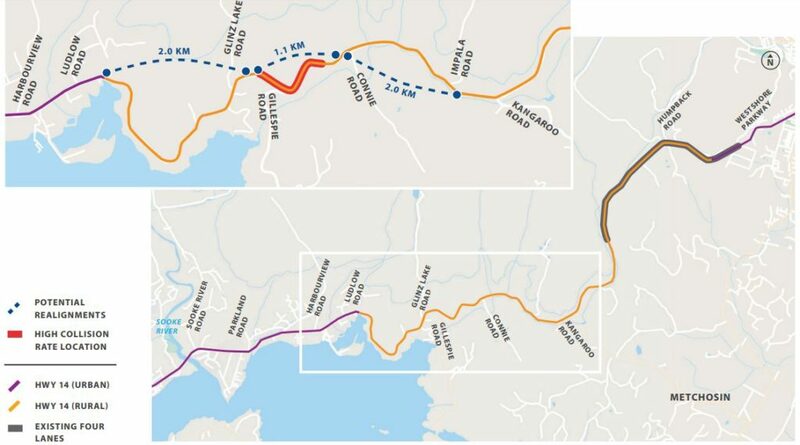 Determine the feasibility of alternate or parallel routes to service Sooke. Determine the capacity limitations of road infrastructure with a view to planning planned growth with road capacity. That Sooke Council direct the development of a comprehensive transportation plan for the District. be integrated into the OCP. During the public input section, another gentleman from the same area presented. Mr. Barry noted that they had lived on their 19 acres since 2000, and the North Sooke Community group was founded in their barn. He began by expressing appreciations to all that Council does for Sooke and the taxpayers. Regarding the plan to realign the highway, he said as it was drown they would have to build two bridges over creek flood planes. He also said that the mere act of drawing this map could render their property unsellable (not that they were thinking of selling, he added). Drawing a dotted line and publishing it on the internet without interacting with the public can have tremendous negative effects. Echoing the group’s concern, Mr Barry noted that at some point somebody has to say to the province, “We needs a second road into Sooke.” There are safety problems with fire and flooding, and the only other option is a five hour detour through Port Renfrew and Cowichan. The other option, he proposed, was a moratorium on development. Letter: Park the panic when it comes to Sooke Road!